You get both the pieces for the Internal Box and External Box complete with the 2 hinges, the half-mortise lock and key and the leather handle plus 2 Enigma logos and screws. You will need to mortise for both hinges and the half mortise lock. Picture above shows flop with mortised lock to give idea of what is expected/possible. 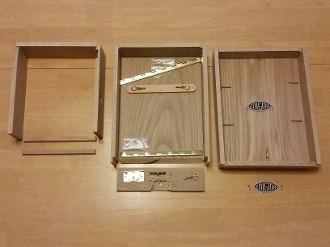 Then the pieces will need final sanding and you may want to spray your assembled box with multiple coats of acrylic lacquer and then drill to receive your top plate. Depending on availability, you can possibly order the box kit in Oak or Cherry. Enquire before you order to see what wood or box kits we have in stock and get a time estimate for shipping.